"A young itinerant worker is forced to confront his secret extraterrestrial heritage when Earth is invaded by members of his race." Due to unforeseen circumstances yesterday with storms knocking out my internet connection, I couldn't post this review as a "Fantasy Friday" update where it belongs, but since it's more about aliens anyway, I now have the first "Sci-Fi Saturday" post in months. It's not that any superhero movie meant for 10-year-olds and 40-something comicbook nerds is a priority for me anyway, so who cares, right? I'm not a fan of Superman in the first place. Back when I was the right age, I saw "Superman: The Movie", but I wasn't impressed. Out of all the superheroes, Superman always struck me as a bit of a wussypants, and Christopher Reeve only confirmed my prejudice. I mean, he has every superpower possible and could rule the Earth if he wanted to, yet he chooses to hide behind the bumbling façade of Clark Kent (as if people can't tell it's the same guy with glasses! ), and just stops a few "bad guys" from time to time. It's pathetic! Superman and everything he stands for makes me want to puke. I never watched more than one episode of the Dean Cain version because of his girlie voice and the fact that Teri Hatcher makes me cringe, and I certainly never watched "Smallville" either. I've seen parts of the other Christopher Reeve movies, but my interest came and went with Ursa (Sarah Douglas) in the first sequel. Thus, even though I'm not an authority on Superman, I've seen enough to know what it's all about, and I just don't care for it. As flawed as it is, I prefer "Hancock" (2008). The trouble is that I sometimes have to watch other genres when the horror genre dries up just to keep abreast of who's who and what's popular. I'd be an even shittier reviewer if I only watched horror movies and nothing else. Thus, I gave "Man of Steel" a chance to change my mind about Superman. 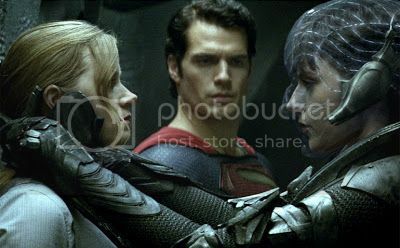 Unfortunately, apart from Antje Traue looking hot as Faora-Ul (an updated version of Ursa), Zach Snyder's "Man of Steel" is easily the worst Superman movie ever made. While I can appreciate the darker tone and Michael Shannon's exceptional performance as General Zod, there's nothing here story-wise that I haven't seen before. As dated as they are, I would've been better off rewatching "Superman: The Movie" (1978) and "Superman II" (1980) instead of this "Transformers" wannabe. "Man of Steel" features such things as disjointed storytelling which is ridiculously hard to follow, visuals which might look spectacular but make no sense, a script written by Christopher Nolan so you know it'll be crap, and lots of CGI buildings being demolished... but that's about it. With a running time of approximately three days, it's far too long and monotonous with it. It's all bang, bang, boom like a Michael Bay film with 90% of it made of swirling computer-generated battles, explosions, and gut-churning aerial shots of places which don't even exist. It's not worth mentioning the big names who have small parts in "Man of Steel" because the only fun for anybody is spotting them and thinking, "Oh my God, so-and-so looks so old now!" I'm not going to take those suprises away from you. Just enjoy them for what they are, and savour the brief moments with Ayelet Zurer who plays Superman's real mother (Lara Lor-Van) at the start because she's really beautiful. She can't act, but she looks great. I didn't think there could actually be a more disappointing superhero movie than "The Dark Knight Rises", but there is now.